Pharmacy technicians work under the direction of a licensed pharmacist and perform technical and clerical duties in the pharmacy. 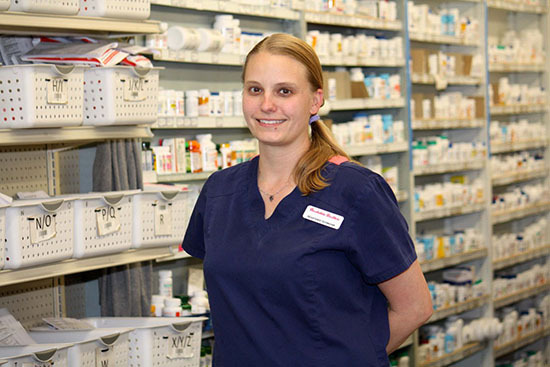 Pharmacy technicians measure, mix, count out, label, and record medication dosages according to prescription orders. Job opportunities abound in hospitals, pharmaceutical laboratories, mail order pharmacies, and pharmacies in retail settings. Blinn offers day, night, and online course options for its 160-hour Pharmacy Technician Program. The program consists of three courses, and includes instruction in pharmacology, pharmacy law and regulations, sterile and non-sterile compounding, medication safety, quality assurance, medication order entry and fill processes, inventory management, billing, and information systems. Students who complete the program will be prepared to take the national Pharmacy Technician Certification Exam. The course curriculum is designed and implemented based on nationally recognized training, assessment, and certification standards set forth by the American Pharmaceutical Association. Courses are taught by faculty comprised of licensed pharmacists and healthcare professionals whose classes are structured to promote quality student-instructor interaction. According to the U.S. Bureau of Labor Statistics, employment of pharmacy technicians is expected to grow 12 percent in Texas between 2016 and 2026. Pharmacy technicians average a median wage of $15.26 per hour, or approximately $31,750 per year. To enroll in the Pharmacy Technician Program, students must first participate in a mandatory information session. To register or to learn more, contact the campus where you are interested in taking courses.